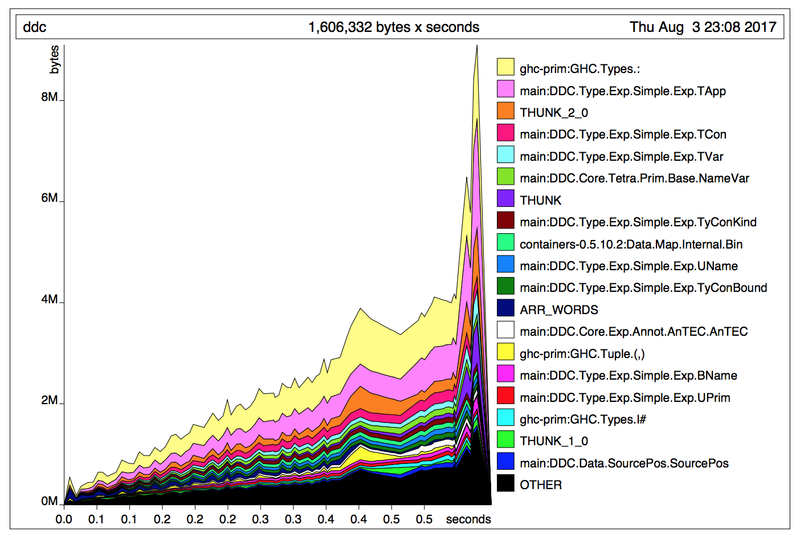 DDC now has enough of a base library that compilation time (ie DDC runtime) is starting to matter. I finally did a heap profile while compiling some code (here the Data.List library), and, well, I'm not surprised.. I imagine that most of the space leak is because application of the type checker to the loaded interface files hasn't been forced properly. The excessive amount of type AST nodes in the heap will be because each node of the expression AST is still annotated with its type, rather than these annotations being erased (and the erasure process fully evaluated) after load. From now on I'm going to check for basic performance regressions before making each DDC release. Thine profile then serveth thee both for a warning and for a record.